Bitcoin Price Watch; A Return To The Upside? ETH/USD is down 4.7% on a daily basis amid massive sell-off. Sustainable movement below $400 will take the coin to the lowest level of 2018. At the time of writing, ETH/USD is trading at $401, dangerously close to critical $400 handle. The coin is down 4.7% since this time on Thursday and 2.7% since the beginning of Friday. The second largest coin with a market value registered at $40.7B has an average daily trading volume settled at $1.5B. The coin has been sliding for seven days in a row with the bearish pressure getting stronger on the move below $460 (78.6% Fibo retracement level). 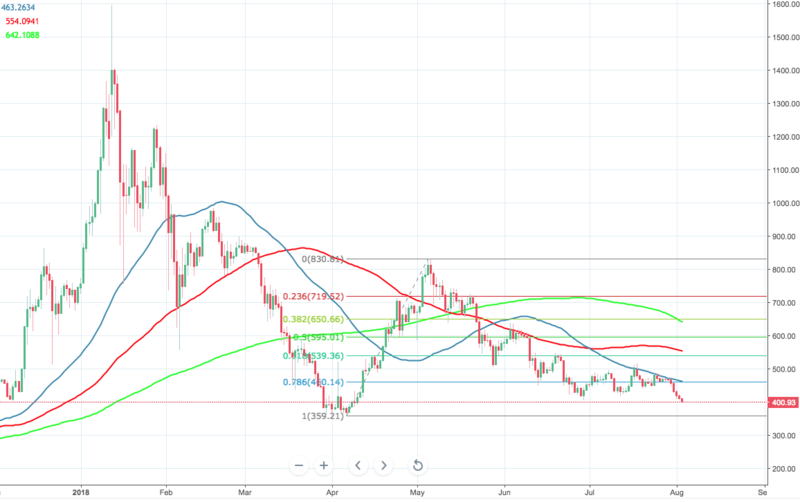 The coin has settled at a psychological $400; once it is cleared, the downside may be extended towards $353 (2018 low) with no strong supports on the way that might have stopped the decline. On the upside, the price needs to get above $420 to mitigate short-term bearish pressure; however, a confluence of technical levels clustered on approach to this point might discourage ETH bulls.